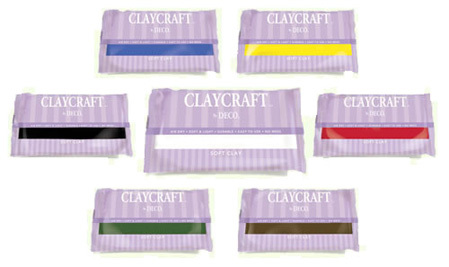 Unlike other clays that need baked, CLAYCRAFT™ by DECO© Soft Clay will air dry to a firm consistency in 24 hours. A Revolutionary type of non-toxic clay that is light weight, smooth and pliable. CLAYCRAFT™ by DECO© Soft Clay comes in 6 vibrant colors plus a brilliant base White in a convenient large size. Knead clay for easy forming and mix CLAYCRAFT™ by DECO© Soft Clay color pigments to create brilliant colors. These clay tools will make working with the clay simple and easy. 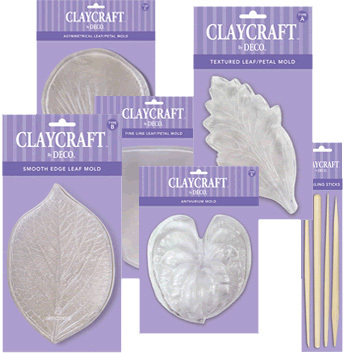 Enjoy all the rewards of professional level clay crafting without the need for ovens and with just a few basic tools. Find all the best CLAYCRAFT by DECO Products here! 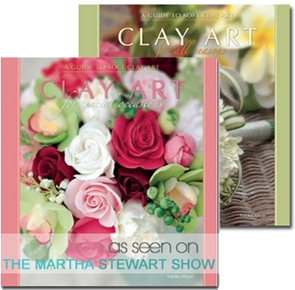 The realism and beauty captured in every CLAYCRAFT by DECO soft air-dry clay creation can be yours with this elegant book inspired by the flowers of Hawaii and beyond. The easy-to-follow instructions in Clay Art for All Seasons and Clay Art for Special Occasions make this exquisite craft available to all. Celebrate special occasions with charming, decorative ideas. Filled with stunning images, these delightful books takes you step-by-step through the creative process so you may enjoy the beauty of this unique and decorative art form.